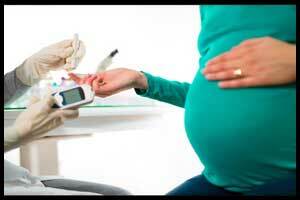 Gestational diabetes may lead to diabetes in children, according to a new study. Gestational diabetes is high blood sugar that develops during pregnancy and usually disappears after giving birth.It can occur at any stage of pregnancy but is more common in the second half. The study of 73 180 mothers compared data on randomly selected single births from mothers with gestational diabetes to births from mothers without gestational diabetes. The incidence — the number of new cases — of diabetes per 10 000 person-years was 4.5 in children born to mothers with gestational diabetes and 2.4 in mothers without. A child or teen whose mother had gestational diabetes was nearly twice as likely to develop diabetes before the age of 22 years. The association was found in children from birth to age 22 years, from birth to 12 years, and from 12 to 22 years.